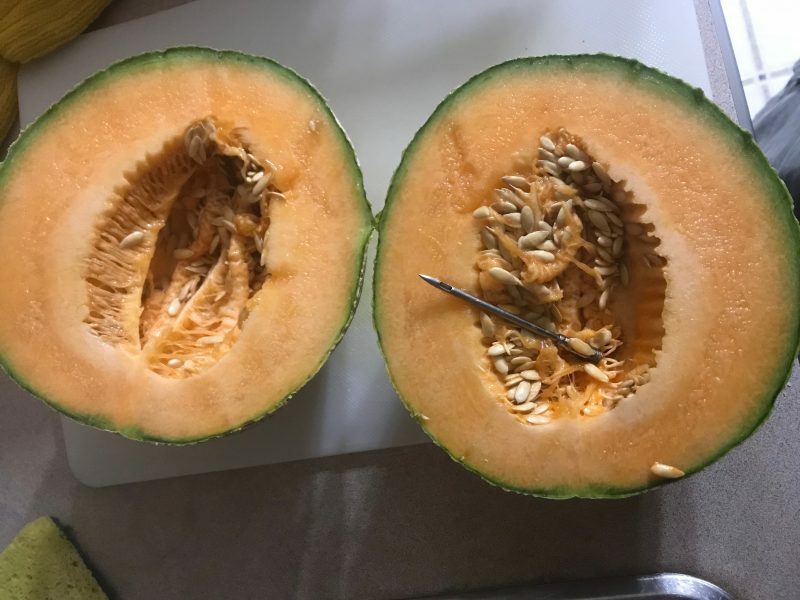 Owings Mills, Maryland – A Baltimore County family is seeking answers after purchasing a cantaloupe with a mysterious “needle” they said they discovered within the fruit last week. The 3 ½” to 4” threaded piece of metal, which appears to be the hollow metal shaft from a device commonly used as a flavor injector, was found within the melon after being purchased on March 25 from the St. Thomas Center Giant Food Grocery Store, located in Owings Mills. But even after a member of the family contacted the store with her concerns and was told the matter was under investigation, The Baltimore Post found two displays in the grocery store on Sunday – five days later – which contained the same type of melons purchased by the family last week which originated from the same Guatemalan processing plant: Fresh Quest. Because it is not known when or where in transport the metal object was inserted into the fruit, the Guatemalan plant is not accused of any wrongdoing. Yet the melons remained on display at the Giant store, even after officials were informed about the object. The company’s communications coordinator confirmed with The Baltimore Post late Monday afternoon that the Giant does not infuse its produce with anything. But a week ago, Monday, when Arnold Canas cut into the melon, he and his wife, Christina, were shocked to see the needle. They then inspected the outside of the melon and saw a small blackened hole and bruise they had not noticed earlier due to other normal imperfections on the fruit. The cantaloupe was purchased earlier the same day. 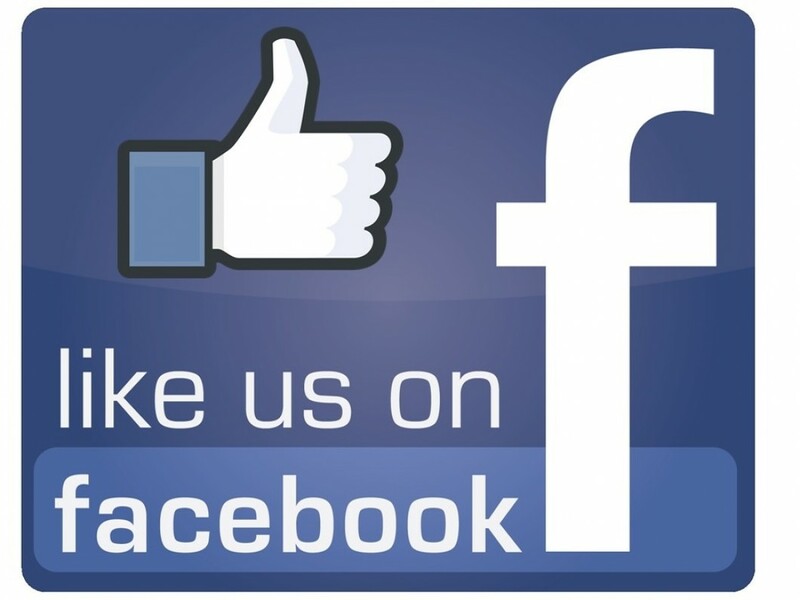 The following day, Mrs. Canas shared the photos and a comment on her Facebook page. 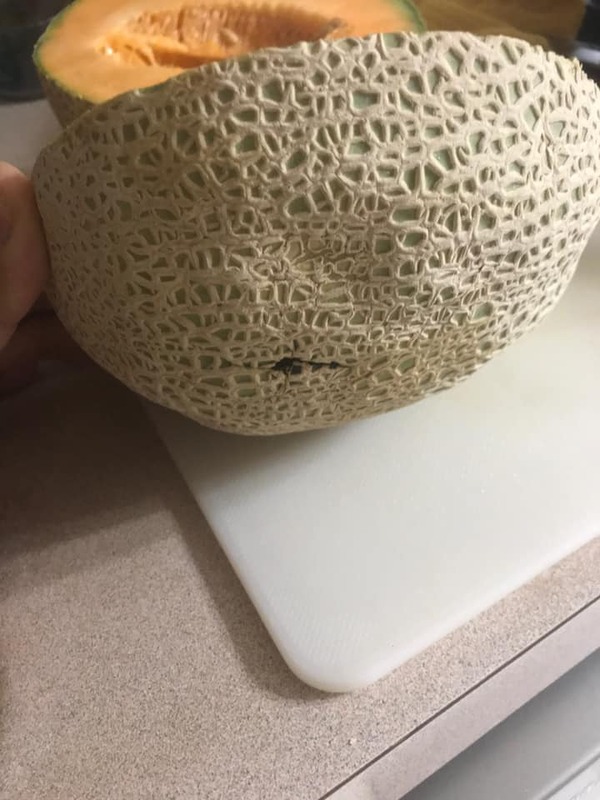 “We cut open our Cantaloupe … to find this! Didn’t realize the outside puncture until we looked after finding this. Arnold has always told me they inject flavor into the fruits and I didn’t believe him. Wow!“ she said. Mrs. Canas then began contacting the store after which a manager offered her a replacement melon or other free food. But Mrs. Canas said she reached out to the store due to public health concerns and for no other reason. “I don’t want anything,” Mrs. Canas told The Baltimore Post. She said she just wants to know what her family has been eating. “This is, at the end of the day, a melon which is a few dollars…” Mrs. Canas told The Baltimore Post. “What is important is what is going on with the melon,” she said. “Are they being injected with something? Was this a random prank? Can I even trust the produce I buy from them? No answers to any of those questions yet but they said they’d follow up,” Mrs. Canas said in an update on her Facebook page. Mrs. Canas said she wants to know if the melon had been injected with some type of sweetener or something else designed to prolong the life of the fruit. “I am not by any means an organic foods person,” she said. But “we buy a lot of produce.” The mother of three said she just wants to ensure that her family is just eating healthy foods. But her calls to get the store to tell her what was wrong with the melon is slow moving. In fact, even a Baltimore Post reporter was able to buy melons from the same store, produced by the same processing plant, five days after Mrs. Canas first notified the store, which was two days after she received a call from Giant’s corporate office that the matter was under investigation. “I, too, am at a loss to explain how something like this could happen,” a representative named Twanda said in a voicemail to Mrs. Canas. “…We followed up with the store and they are going to review and research and investigate this with our produce …department …and management team…,” the representative said. The Baltimore Post called a neighboring Giant which is charged with managing the Owings Mills store, but the produce manager would not comment on the matter, but said he would have Giant’s corporate office reach out to The Baltimore Post. While the store’s investigation is underway, it is not yet known what happened with the melon nor how the flavor injector got into the fruit. But in other reports about needles found in produce, India appears to be leading the world in media scrutiny over a practice in which fruits and vegetables are sometimes injected with hormones and dyes to accelerate the ripening process and overall appearance of them. In a 2015 Tribune News Service story titled, “Needle found in musk melon,” a reporter wrote, “Everyone is tempted towards bright coloured and juicy fruits being sold in markets by roadside vendors. But beware of extra bright colour and shine you see in these fruits. Most of the watermelons being sold in the market are red and juicy…. ‘This implies that most of the melons being sold in markets nowadays are ripen(ed) by artificial methods,’” said a retired official of the Health Department in India who was quoted in the article. The Baltimore Post called the Baltimore office of the Food and Drug Administration (FDA) but a supervisor said the FDA does not comment for stories. After being asked to call a press agent, the agent said that someone else would have to look into the matter. The Baltimore Post is awaiting a response to the Canas’ case as well as answers to whether or not the FDA approves the practice of growers potentially injecting produce with substances. Freeland-based farmer, Lisa Wheeler of Oak Spring Farm, was surprised by the occurrence. Wheeler said that buying local is a way to know better what is in the produce buyers consume. And, she said, it’s best to know one’s farmer and to always buy seasonally. Wheeler, has been in business since 2011 and runs an organic farm which adheres to strict guidelines for food production which disallows the use of chemicals or injections. But she said her comments are not about buying from anyone in particular. Instead, Wheeler said the important thing is for people to know where their food is coming from. She said that by people supporting their local growers, in so doing, they are supporting their own health. “It’s about understanding the risk, supporting local, supporting your health, and the health of your local (farms),” Wheeler said. The status of the Giant’s investigation into the cantaloupe is not known. Neither is a response from the FDA about whether or not it is an accepted practice for produce to be injected with substances, especially when not labeled. As of Monday afternoon, Mrs. Canas said she still has not been provided an update on the investigation.